Charlie Puth Announces Summer 2018 Tour with Hailee Steinfeld! Charlie Puth and Hailee Steinfeld will be going on tour together this summer! 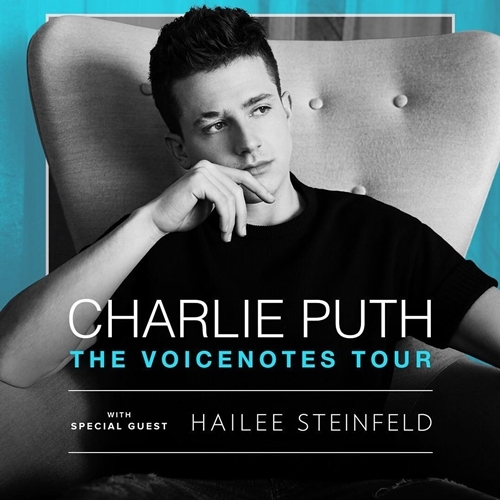 The tour is titled The Voicenotes Tour and Hailee is listed as Charlie‘s special guest. The tour kicks off on July 11 in Toronto and they will be playing shows all across North America until September 1 with a final show in Florida. Pre-sales for the tour kick off on Tuesday, December 19 and tickets go on sale to the general public starting on Friday, December 22. At just 21-years-old, Hailee Steinfeld already has a career that entertainers thrice her age would be envious of. She was nominated for an Academy Award—at 14-years-old, no less—for her breakout role in True Grit, and starred in a string of box office hits ever since—and just so happens to have a wildly successful pop career on the side. It’s hard to believe that it wasn’t so long ago that Steinfeld was just a teenager, embarrassed to be going to the movies with her parents to see the acapella comedy Pitch Perfect. Cut to just five years later, and Steinfeld is starring in the film’s third installment, after a leading role in the sequel in 2015. But despite all her successes, Steinfeld remains delightfully grounded—a quality she attributes to her parents—and still geeks out on certain things just like your average college age girl—namely, the hit Netflix series 13 Reasons Why. Here, Steinfeld talks Pitch Perfect, her love of Paula Abdul, and more. When did you see the first Pitch Perfect? I distinctly remember seeing the first Pitch Perfect in theaters with a friend of mine and my parents actually, and at that time it was a little cooler to sit in a different row than your parents. So I was with my friend, and if we weren’t singing along to a song that we loved, my parents were, and I just thought like “How great is that a movie like that can bring every one and anyone of all ages together.” I was obsessed with it and immediately thought, “If there is ever another movie like this, I have to be a part of it,” not even realizing that there would be a sequel at that point. The minute I found out that it was a thing and that it was happening, I called my agent and said “I don’t even know if there’s a part in this for me, but I want in.” So that’s where it started. Your singing career came before that second movie came out—were you always planning to have the singing career, or did Pitch Perfect sort of jumpstart you? Singing has always been a part of my plan, and as an actor, I always wished and hoped that it would happen through a movie so that it wasn’t a matter of “Here I am dropping an album and this is now what I wanna do,” but instead it would make sense, and the timing was right. It became the perfect opportunity to segue into music. Do you get to sing more in the latest film? I do sing a bit more. It was cool, obviously coming into the third one as more of an artist than I did with the second one, and music in the movie is awesome. And last year you were nominated for a Golden Globe for your role in The Edge of Seventeen. What was that like?